Professor in the Faculty of Science and Tier I Canada Research Chair, Roderick Melnik is an applied mathematician and scientist with over 25 years of academic and industrial research experience. 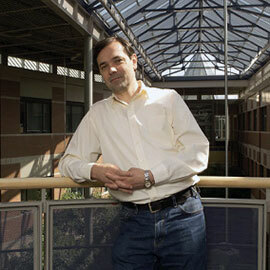 He is the director of the MS2Discovery Interdisciplinary Research Institute. Prior to his appointment in Canada, Melnik held full professorships in the U.S.A. and Denmark, while in the late 1990s, he held the position of senior mathematician at the Commonwealth Scientific and Industrial Research Organisation (CSIRO) in Sydney, Australia. He received his PhD in Computational Mathematics and his MSc in Applied Mathematics from Kiev State University in 1989 and 1985, respectively. Melnik has been a recipient of a number of awards, including prestigious fellowships in Italy, Denmark, England and Spain. He has published over 300 refereed research contributions in the field of applied mathematics, computational science and mathematical modelling in sciences and technology. He serves on editorial boards and has been a guest editor of many international journals and book series. He is a member of such professional societies as SIAM, ASME, CAIMS, AustMS and its ANZIAM Division. Roderick Melnik is head of the M2NeT Laboratory (Mathematical Modelling for New Technologies) and is affiliated with the University of Waterloo and the University of Guelph, as well as with the Guelph-Waterloo Institute of Physics. The main thrust of Melnik’s research program has been focused on coupled multiscale phenomena, processes and systems. Some of the most important and challenging problems in science and engineering are coupled problems. The coupling is pronounced at 3 basic levels: (i) the level of field coupling as it is the case in thermo-elasticity, electro-elasticity and in many other areas of applications, (ii) the level of coupled effects between different parts of the system, and/or (iii) the level of coupling between different spatial/spatio-temporal scales at which the natural or man-made system, that is being studied, operates. This coupling brings to life new phenomena, the phenomena which are not amenable to an adequate description with conventional mathematical models, traditionally developed without accounting for the coupled nature of the problem. An early observation that the coupling in nature plays a profound role was made by Aristotle who noted that "the whole is more than the sum of its parts." The development of coupled mathematical models has an interesting history with one of the first examples attributed to Pierre Simon Laplace who corrected Newton's purely mechanical theory of sound propagation by accounting for thermal field effects. Another important example includes the development of a dynamic model of coupled electro-magnetic interactions by James Clerk Maxwell. Melnik’s research group and the M²NeT Lab focus on the development of coupled mathematical models for addressing fundamental questions of science and solving new problems in science and engineering. They study coupled phenomena, effects, and processes that are becoming increasingly important in the areas of nano- and bio-nano technologies, in new technologies based on smart materials and structures, biocompatible materials and bio-inspired systems, and in other areas. Tier I Canada Research Chair, since 2004. Santander UC3M Chair of Excellence Professorial Fellow, 2012-2013. Ikerbasque Professorial Fellow bestowed by the Basque Foundation of Science, 2012. Professorial Fellow of the Institute of Advanced Studies, Italy, 2011. Invited Member of the New York Academy of Sciences, 2000. Elected Fellow of the UK Institute of Mathematics and its Applications, 1998. In the period between 2001 and 2014, Roderick Melnik has supervised 56 graduate and undergraduate students, postdoctoral fellows and research associates. His students and postdoctoral fellows present their work in national and international conferences. A strong combination of skills in mathematical modeling and its application is a valuable asset that is acquired by his students in Melnik’s lab. Research opportunities exist for PhD, MSc and undergraduate students in areas ranging from mathematical modeling in nanosciences to biological applications, and to social science, networks and finance. Consult the available information for prospective students at Melnik’s lab website and contact him for more information. View publications on the M²NeT Lab website.